Perfect for tea parties, bridal showers, princess birthday parties, baby showers, a special gift, or just sipping a little tea in the afternoon. . . Place one on the top of a cake as a lovely topper. Or fill several with tiny bouquets of flowers and line them down a table for a sweet centerpiece. And what about wedding favors? How sweet at each place setting, filled with tasty chocolates or tiny bouquets. This listing is for ONE child's sized tea cup and saucer set. Price is per tea cup/saucer set, however great discounts for multiple cups purchased -- they make lovely party favors. Coordinating tea set (creamer, sugar bowl and tea pot) also available. Send me a convo and we can work on an order together! All handpainted in your choice of colors & personalization. Actually holds liquids for sipping tea or punch! Handpainted using food-safe, dishwasher safe paints and glazes and fired in my kiln. 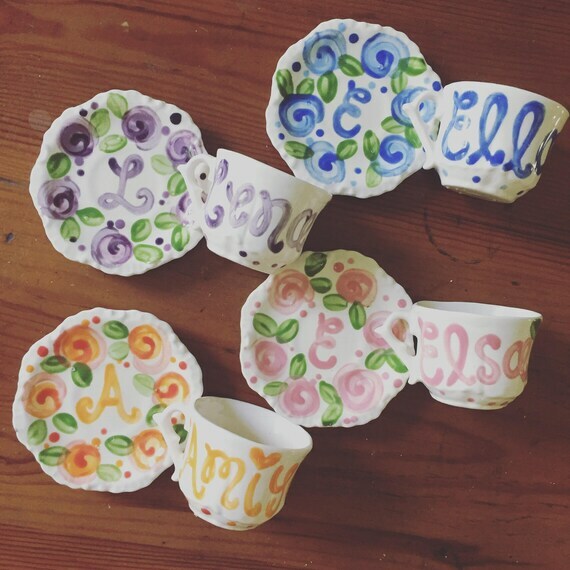 Since all my items are custom painted just for you, I will be happy to change the colors and design to suit your taste -- I love it when you send me an 'inspiration' piece so I can coordinate the tea cups perfectly. Please allow 1-2 weeks for shipment - as with all my items - since they are custom painted just for you!